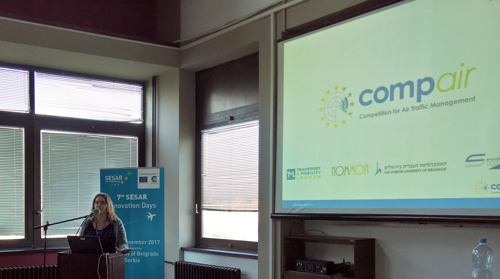 The COMPAIR Consortium has participated at the Seventh SESAR Innovation Days what was held in Belgrade between the 28th – 30th of November 2017. Consortium members Dr. Eef Delhaye from Transport and Mobility Leuven and Javier Torres from Nommon have delivered two presentations on the first day afternoon session. Dr. Eef Delhaye delivered a presentation titled “Ownership Form & Air Navigation Service Provider Performance”. The presentation was discussing how the various ownership models of an ANSP could influence the competition, efficiency, costs and willingness to invest into technological advance. 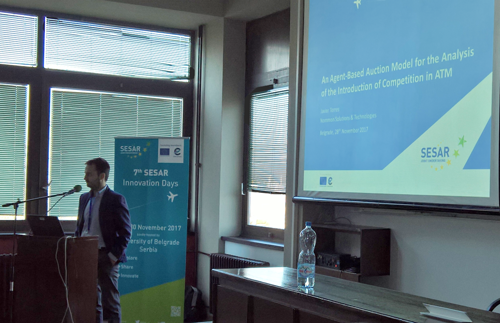 Javier Torres delivered a presentation titled “An Agent-Based Auction Model for the Analysis of the introduction of Competition in ATM". The presentation was providing an insight into the work of the Nommon in the frame of the COMPAIR project where they have developed an agent-based model to simulate the outcomes of the competition with different variables applied to it.